I study the mechanisms and signaling pathways underlying shortsightedness (myopia) by employing methods of genetics and molecular biology since the beginning of my PhD in Prof. Frank Schaeffels lab (Tuebingen, Germany). I pursue this interest now during my first post-doc in the lab of Prof. Josh Wallman (New York, USA). Myopia or hyperopia can be easily induced in a variety of animal models (e.g. chick, mouse, guinea pig, tree shrew, monkeys) by applying negative lenses (thus shifting the focal plane behind the retina) or positive lenses (shifting the focal plane in front of the retina). The eyes of chicks compensate especially quickly to these visual stimuli by either increasing or decreasing the rate of elongation of the eye until the focus is on the retina again and sharp vision is restored. How the retina detects where exactly the focal plane is (behind or in front of the retina) remains a mystery, but because the growth response is too quick to be a "trial and error" response (only 10 minutes of lens wear are sufficient to provoke a specific change in axial growth a couple of hours later)1 it seems clear that the retina acts as a sensor and is signaling the other components of the eye to change in order to either increase or reduce the overall axial length. These changes in the other components are very specific; the choroid (the vascular layer behind the retina) thins within minutes (pulling the retina backwards towards the new image plane) when negative lenses are worn and increases in thickness (pushing the retina forward), when positive lenses are applied. After a couple of hours, the biomechanical properties of the sclera start to adjust to the altered visual stimuli by changing the extracellular matrix (ECM) synthesis and turnover. My first main focus right now is to study this scleral response with the help of the chicken as an animal model. The chicken, unlike eutherian mammals, has two scleral layers. An outer fibrous sclera (FS) (which is comparable to the mammalian sclera) and an inner cartilaginous sclera (CS). These two tissues show changes in the opposite direction in response to the induction of myopia or hyperopia. The FS is decreasing its thickness when myopia is induced, while the CS is getting thicker and the reverse is true for an eye becoming hyperopic (increased FS and decreased CS thickness and strength). Previous studies in our lab have shown, that fibroblast growth factors 1 and 2 (FGF1 and FGF2) influence the growth of the two scleral layers in a manner similar to the induction of hyperopia (ECM production was measured indirectly by the incorporation rate of radioactive sulfur S35 into glycosaminoglycans). Currently, four FGF-receptors are known (FGFR1-4), with several isoforms for FGFR1-3 which differ mainly in their extracellular IgG domains, which determines their binding specificity to members of the FGF family (23 different FGFs are known at present) and the subsequent downstream events. We designed primers for the FGFR IIIb and IIIc isoforms of FGFR1-3, for FGFR4 and for a related receptor, the cysteine-rich FGF receptor (CFR1) in order to elucidate whether a difference in the expression levels of those receptor isoforms might be the cause for the opposite response of the FS and CS. We treated two-day-old chickens with either a +5.5D lens or a -4D lens over one eye for 24h (the untreated eye served as control). After euthanizing the chicks, the eyes were dissected, the scleral layers were separated, RNA was isolated and semi-quantitative real-time PCR was performed with beta-actin as a reference gene. Results: Interestingly, all receptors studied were present in both layers, with mRNA expression levels being generally higher in the CS (lower Ct-values for all genes tested, even beta-actin). Only the mRNA expression levels of FGFR2IIIb were significantly changed due to the treatment, being up-regulated in the CS in plus lens treated animals and down-regulated in minus lens treated animals. The reverse was true for the mRNA expression levels in the FS (Figure 1: ANOVA of log10 (MNE treated/MNE untreated); p = 0.048). FGFR2IIIc showed a similar pattern, although not significant (ANOVA; p = 0.077). Data shown are the Log10 values of the ratios of the Mean Normalized Expressions (MNE) of the treated eye (X) divided by the MNE of the control eye (N) for both treatments (either +5.5D lens or -4D lens) for the two tissues (CS = cartilaginous sclera, FS = fibrous sclera). Each dot represents one animal (n = 5 to 8). The line in the center of the diamonds represents the group mean and the vertical span of the diamond indicates the 95% confidence interval. ANOVA was significant only for FGFRIIIb (p = 0.048), where plus lens treatment lead to an increase in mRNA levels in the CS and a decrease in the FS and minus lens treatment induced the reverse response. Similar mRNA expression patterns could be seen for the FGFRIIIc isoforms, although this effect was not statistically significant (ANOVA: p = 0.077). Lens treatment seems to mainly affect FGFR2, since none of the other studied receptors showed changes in mRNA expression levels. However, it is still possible that the other FGF receptors contribute equally, since they seem to be present in both layers and an increase in the number of receptors on the cell surface is not essential for eliciting a specific change in growth. The reciprocal effect of lens-wear on FGFR2 mRNA expression levels in the two tissues strengthens our hypothesis that FGF signaling is contributing to the changes observed in the sclera and the direction of regulation suggests a negative feedback loop for FGFR2. Our next step will be to measure choroidal mRNA expression levels of different FGFs that predominantly bind to both FGFR2 isoforms in order to see whether the choroid releases specific FGFs towards the sclera which then in turn promote the different growth responses of the two scleral layers. My second main project is to further specify the role of retinoic acid (RA) in retinal-choroidal-scleral signaling after the induction of myopia or hyperopia in different species (chicks, guinea pigs and marmosets). We already know that the synthesis rate of RA is increased in choroids from chickens treated with plus lenses and decreased in the choroids of chicks wearing minus lenses and the reverse is true for guinea pigs and marmosets2-4 (Figure 2). Additionally, RA is able to inhibit proteoglycan synthesis of the chick sclera. 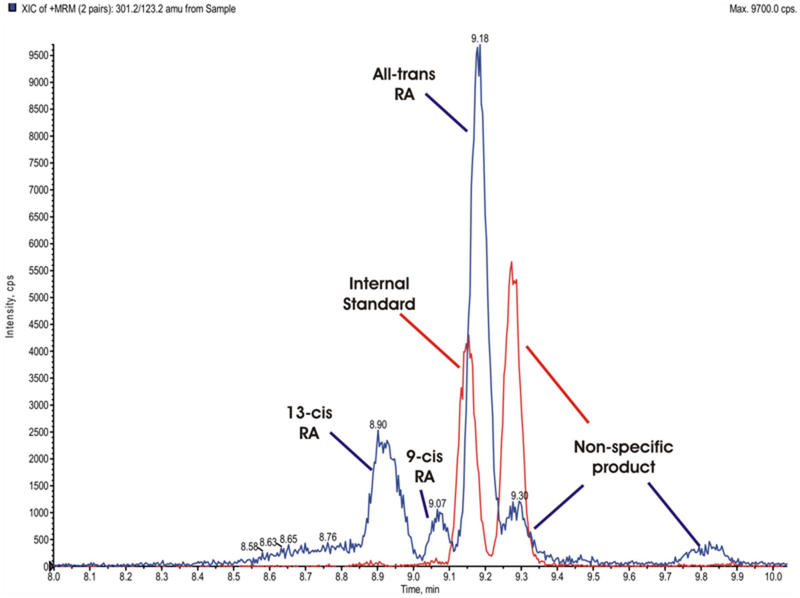 Since the detection limit of the regular HPLC used in these previous studies was relatively high and samples had to be pooled sometimes, we established a method to isolate retinoic acid and quantify the most common known isoforms (9-cis, 13-cis and all-trans RA) with liquid chromatography-mass spectrometry (LC-MSMS) using the 4000QTrap LC/MS/MS system from Applied Biosystems. 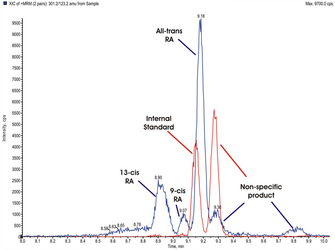 With this instrument, we are now able to identify and quantify all three isoforms of RA in the femtomolar range. We are currently measuring RA levels and synthesis rates from chicken, guinea pigs and marmosets under various experimental conditions in collaboration with Dr. Sally McFadden, University of Newcastle, Australia and Dr. David Troilo, SUNY State College of Optometry, New York, USA (for representative spectrums of the three species, see Figure 3). Figure 2: Figure has been copied from Troilo et al., 2006 (reference 3). 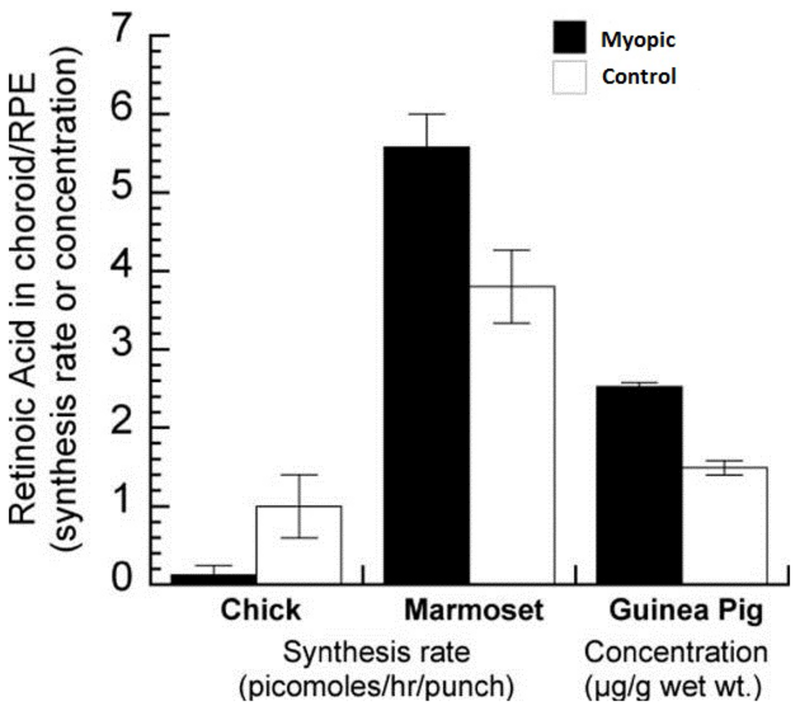 Shown are the mean ± SD retinoic acid synthesis (chicks and marmosets) or concentration (guinea pigs) in the choroid/RPE of myopic relative to fellow untreated control eyes. All studies showed a statistically significant difference in the treated vs. the untreated control eye, with the effect in the chicken being the opposite to the effect in marmosets and guinea pigs. Figure3: Representative traces obtained by LC-MSMS from one chicken retina (tissue was a retinal punch, Ø 7mm). The RA isomers are separated based on their retention time (X-axis) in the LC-part of the instrument. The internal standard (IS) used was deuterated all-trans RA. The exact amount of the RA isoforms and the IS is calculated based on the area under the respective peak which is directly correlated to the concentration of RA in the sample and determined by comparison to a standard curve with known concentrations. Zhu, X.; Park, T.; Winawer, J. & Wallman, J. (2005). In a matter of minutes the eye can know which way to grow. Invest. Ophthalmol. Vis. Sci., 46, 2238-2241. Mertz, J.R. and Wallman, J. (2000). Choroidal retinoic acid synthesis: a possible mediator between refractive error and compensatory eye growth. Exp. Eye Res., 70, 519-527. Troilo, D.; Nickla, D.L. ; Mertz, J.R. & Summers Rada, J.A. (2006). Change in the synthesis rates of ocular retinoic acid and scleral glycosaminoglycan during experimentally altered eye growth in marmosets. Invest. Ophthalmol. Vis. Sci., 47, 1768-1777. McFadden, S.A.; Howlett, M.H. 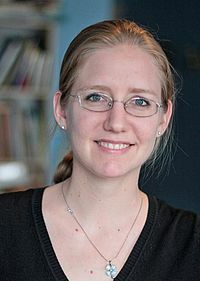 & Mertz, J.R. (2004). Retinoic acid signals the direction of ocular elongation in the guinea pig eye. Vision Res., 44, 643-653.